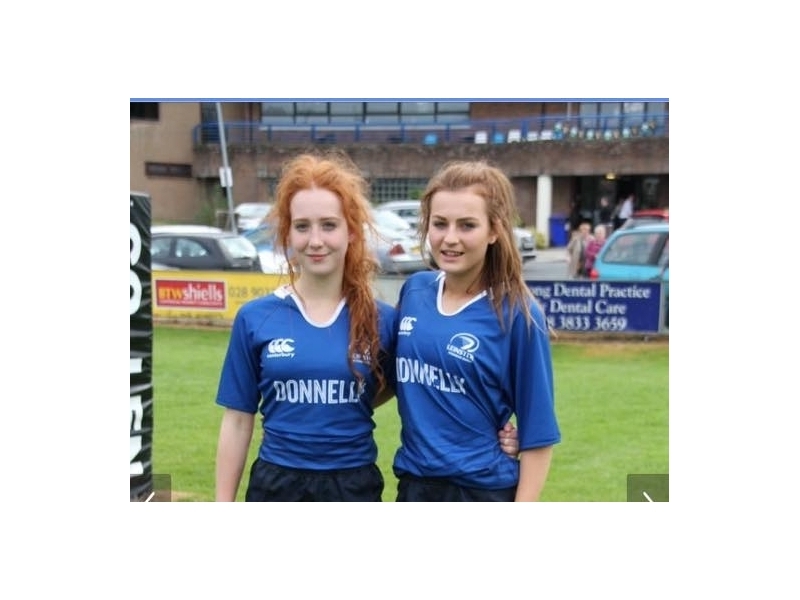 Well done Ella and Megan on winning the interpros with Leinster. The Leinster U18 girls won this year's Interprovincial Development Series in style last Saturday with a winning 21-14 performance against Ulster in Portadown RFC. Not only did they manage a clean sweep in the U18 Interpro Series, the girls were the first team to travel on the new Leinster Rugby Aircoach bus. The girls travelled to Portadown RFC knowing that only a win would clinch the series but their performances last week in Westmanstown RFC were a good indicator of what was to follow. Portlaoise RFC's Eimear Corri broke the deadlock in the 5th minute in one of her trademark runs after full back Katie Heffernan of Mullingar RFC found some space just inside the Ulster half. 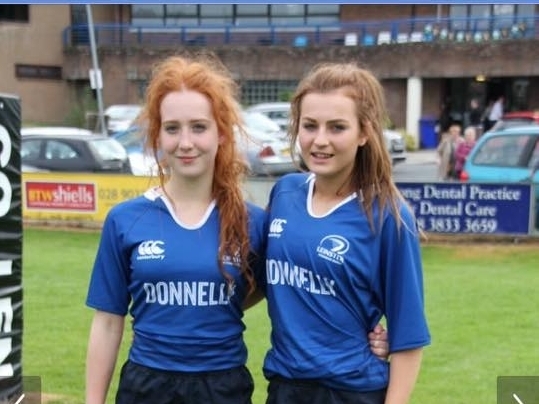 She passed to Wicklow RFC's Kayleigh Sullivan and Sullivan's pass found Eimear Corri. She could have easily grounded in the corner but had the presence of mind to make the kick easier for her Leinster and Portlaoise teammate, Liz Brophy, who landed the conversion with ease. Ulster piled on pressure from the restart, forcing a number of penalties from Leinster, but even still the girls kept Ulster in their own half. Leinster's second try came shortly before half time when Mary Healy of Naas RFC, whose ball carrying skills were excellent all day, ran in despite a number of Ulster players trying to tackle her. Again Portlaoise RFC's Liz Brophy converted to bring the score to 0-14 at half time. Ulster restarted the second half and straight away gave a penalty to Leinster, which was not the start they had hoped for. Leinster's support play was outstanding, with numbers in every ruck and managing a number of turn overs throughout the half. Leinster's third try was scored by scrum half Hannah Rose Buckley when the Wicklow RFC player crossed the line after a number of phases brought Leinster to the Ulster try line. Again Portlaoise RFC's Liz Brophy kicked the conversion with ease. Ulster began to look more threatening from the restart and Leinster leaked a number of penalties in the breakdown which Ulster used to make their way deep into Leinster's half. Their reward came from a try scored by Sara Whitley, who crashed over the line, while Dolores Hughes kicked the conversion. The Ulster girls attacked again from the restart and a momentary lapse in discipline saw the Leinster team concede a penalty which saw them marched back an extra 10 metres by the referee. The Ulster girls continued their comeback with gusto and their pressure was rewarded with a second try scored by Claire Boles, converted by Dolores Hughes. Leinster were rattled by the comeback from their Ulster counterparts but remained strong in defence and had a number of chances to score in the dying minutes of the game. A penalty against Ulster just inside their 22 gave Leinster the chance to move two scores ahead with minutes left but the kick from Mullingar RFC's Katie Heffernan pulled left and wide. The Leinster girls maintained their composure though and there was elation from the Leinster team and their supporters, who travelled in large numbers, as the referee blew the whistle for full time. Huge credit and congratulations must go to the coaching staff led by head coach Aoife Thompson and assistant coaches, Ireland and Leinster star player Sophie Spence and Leinster Rugby CCRO Damien McCabe, and not forgetting team manager David McKeown! Special thanks go to David Corri who was on hand to take some great action and team shots of the girls. Next year sees the U18 interpro series move away from development into a full competition and going by this season's fixtures and results, the future of the women's game at interprovincial and national level looks very bright indeed!